On dark burning medium temperature stoneware bodies, clear glazes often do not look good. These bodies contain more raw clays that contain larger particles that generate gases on decomposition during firing. These often cloud up typical clear glazes with micro bubbles, marring their appearance. There are solutions. Although more fluid-melt clear glazes have risks (e.g. running, blistering) they do clear bubbles better. If applied thinly (so they do not run during firing) they can work very well in this circumstance. Of course they do darken the body color (this body, Plainsman M390, fires red without glaze). 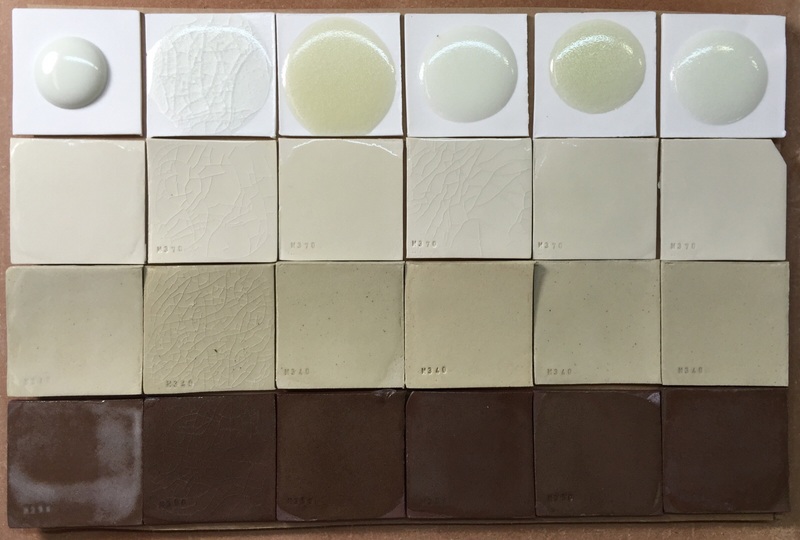 This outside glaze is G3806C. 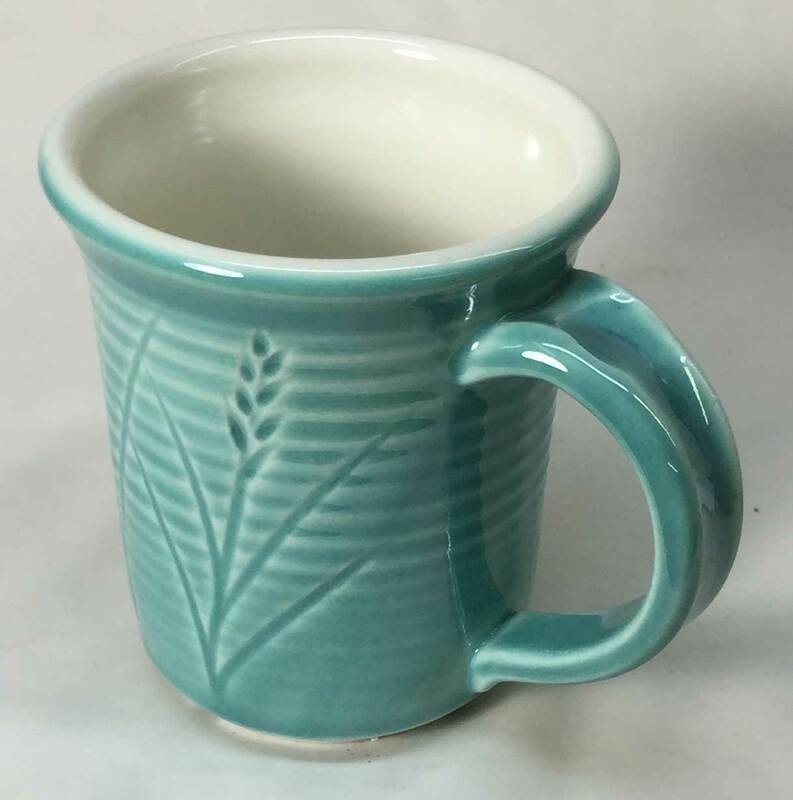 This is the winner of a five-way cone 6 copper blue glaze comparison that started with my dissatisfaction with Panama blue. 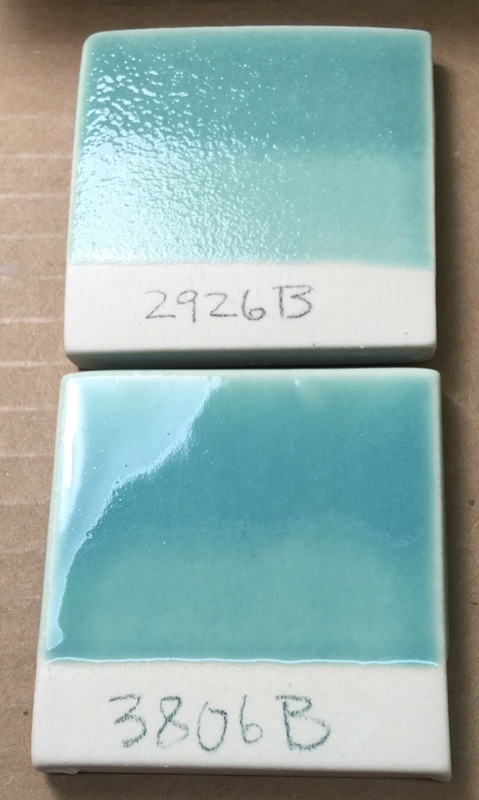 When I compared these glazes I did not just eyeball them on a tile. I compared the melt flow, thermal expansion and slurry performance of the bases (without the copper and tin). Ball-melt GBMF tests also compared bubble and color development for very thick sections. Then I tried more copper and did more flow tests. I also did leaching tests. Where needed I adjusted recipes to increase clay content (while maintaining chemistry) so the slurries would work better. Without my account at insight-live.com to keep all of this organized it would have been so much more difficult, actually, I probably would not even have bothered with the project. The recipe is G3806C. The first glaze is a control, a standard non-fluid clear with copper. The other three are the short-listed ones in my project to find a good copper blue recipe starting recipe and fix its problems (which they all have). The GLFL testers for melt flow at the back and the GBMF test melt-down-balls in front contain 1% copper carbonate. The glazed samples in the front row have 2% copper carbonate. L3806B, an improvement on the Panama Blue recipe, has the best color and the best compromise of flow and bubble clearing ability. This is not just a typical transparent cone 6 glaze with copper added. Knowing what is different about this clear base, its trade-offs and how it was developed are important. The porcelains are Plainsman P300 and M370. The liner glossy glaze is G2926B, it has a much lower melt fluidity than the outer glaze (as a functional transparent its main job is to fit the body and be hard and durable). But in order for that outer glaze to accommodate the copper and still be super glossy it must have a much higher melt fluidity. It was tricky to develop since that fluidity comes with high sodium and lower silica, that raises the thermal expansion and moves it toward crazing. See the G3806C recipe for more info. Two transparent glazes on the same dark burning clay. Why different? 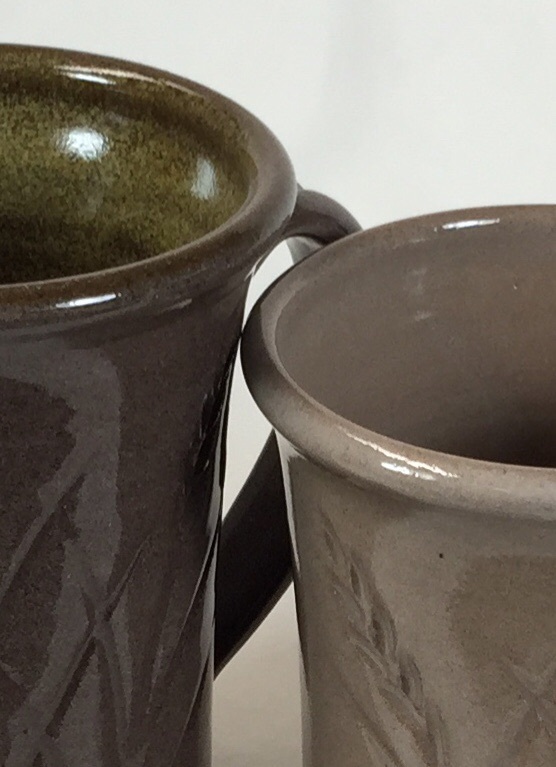 These two glazes are both brilliant glass-like super-transparents. But on this high-iron stoneware only one is working. Why? G3806C (on the outside of the piece on the left) melts more, it is fluid and much more runny. This melt fluidity gives it the capacity to pass the micro-bubbles generated by the body during firing. G2926B (right) works great on porcelain but it cannot clear the clouds of micro-bubbles coming out of this body. Even the glassy smooth surface has been affected. The moral: You need two base transparents in which to put your colors, opacifiers and variegators. 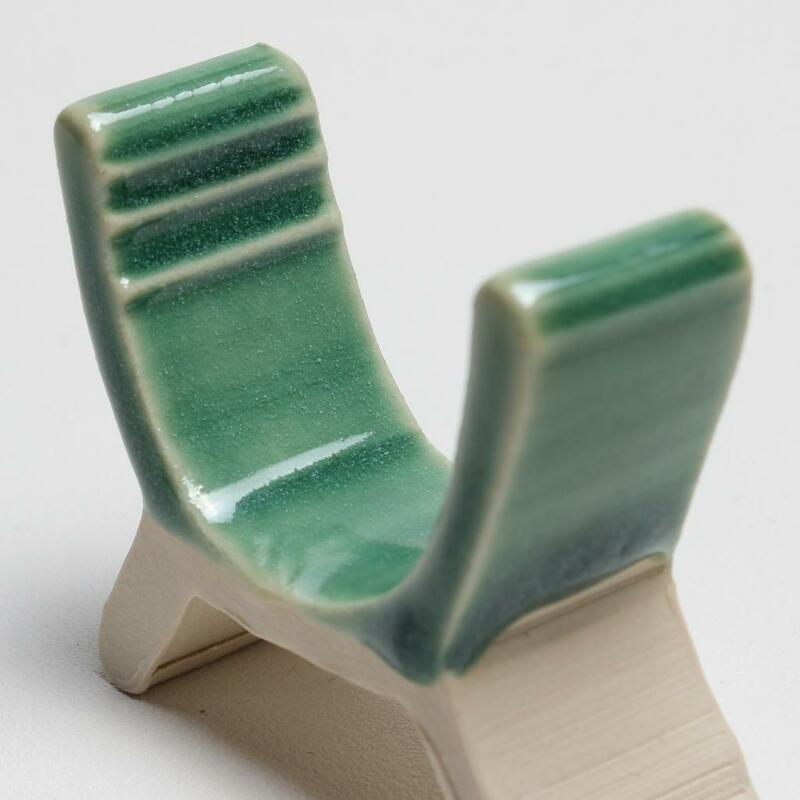 Reactive glazes need melt fluidity to develop those interesting surfaces. But they are more tricky to use and do not fire as durable. Crystallization (also called devritrification). You can see the tiny crystals on the surface of this copper stained cone 6 glaze (G3806C). The preferred orientation of oxides in crystalline, especially when metal oxides are present. 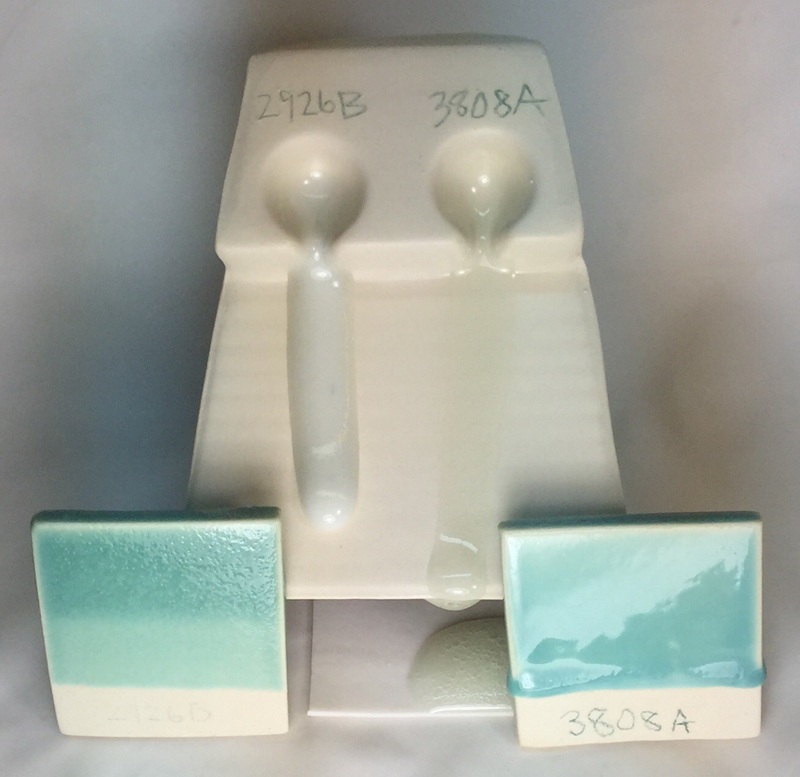 When kilns cool quickly there is simply no time for oxides in an average glaze to organize themselves and crystals do not grow. But if the glaze has a fluid melt and it cools slowly through the temperature at which the crystals like to form, they will. 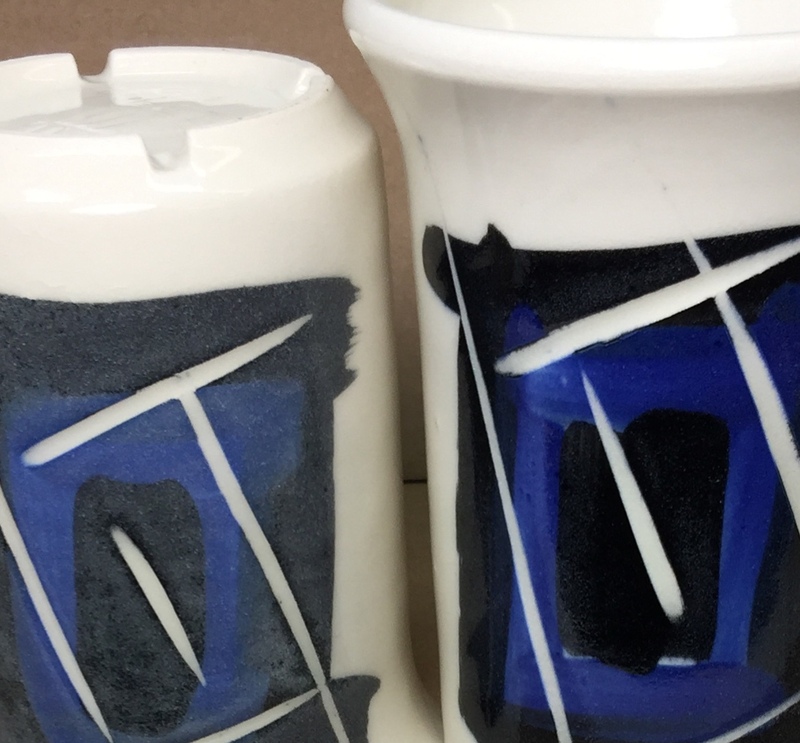 Does it matter which transparent glaze you use over underglazes? Yes. 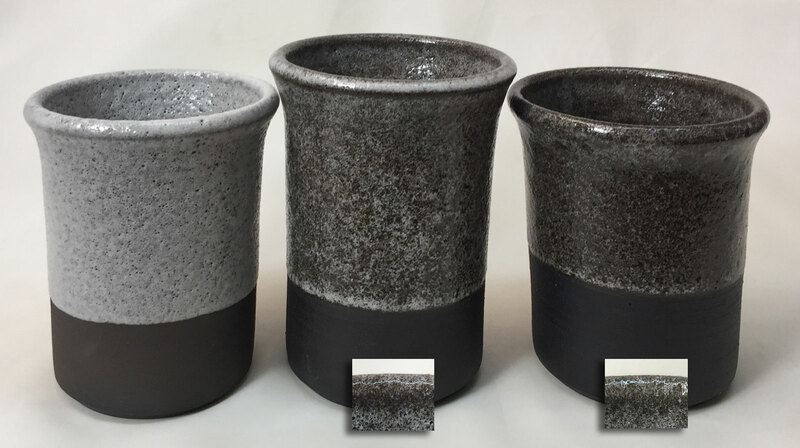 These porcelain mugs were decorated with the same underglazes (applied at leather hard), then bisque fired, dipped in clear glaze and fired to cone 6. 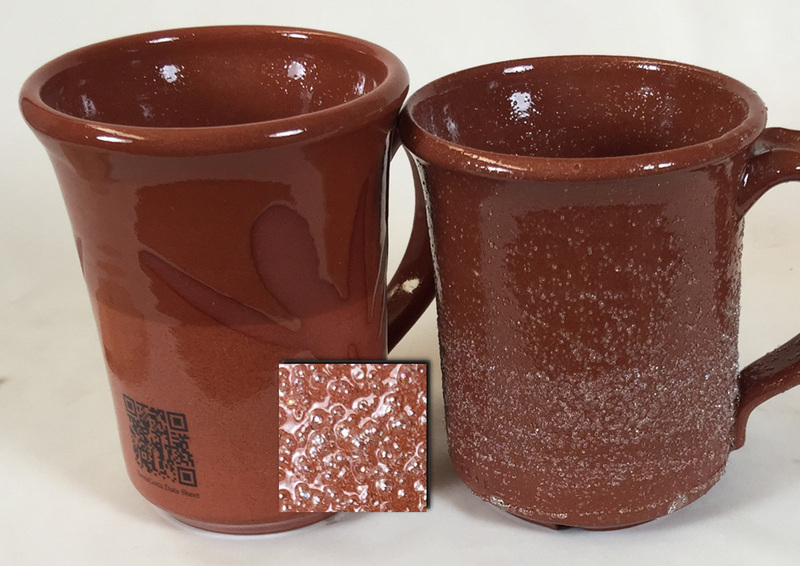 While the G2926B clear glaze (left) is a durable and a great super glossy transparent for general use, its melt fluidity is not enough to clear the micro-bubbles generated by the underglazes. 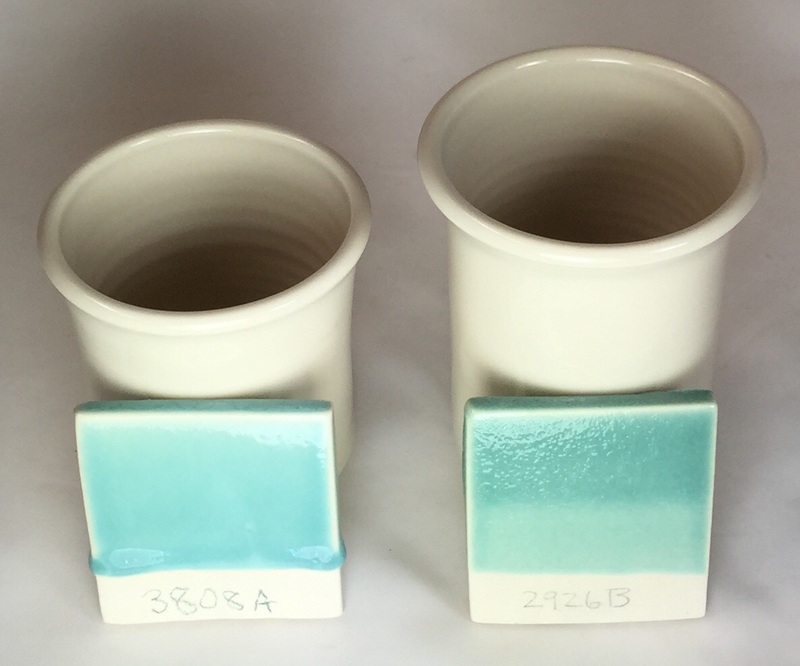 G3806C (right) has a more fluid melt and is a much better choice to transmit the underglaze colors. 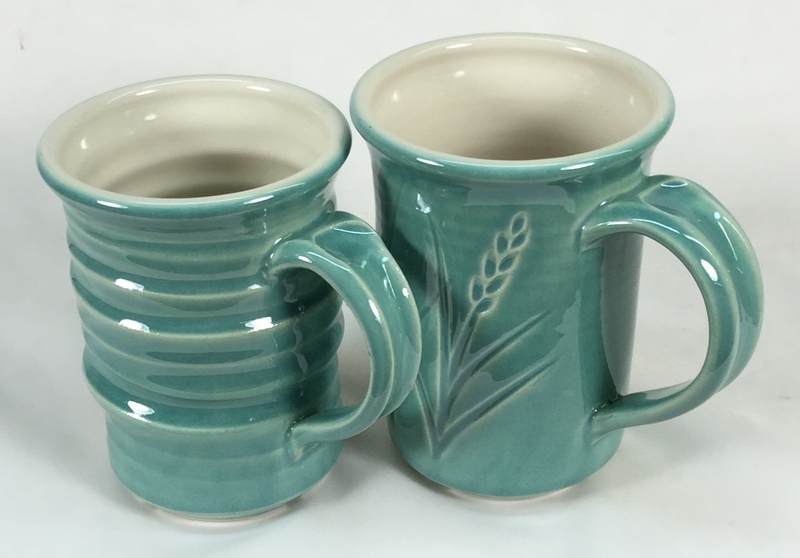 But I still applied G2926B on the inside of the mug on the right, it has a lower thermal expansion and is less likely to craze. Fired at cone 6. A melt fluidity comparison (behind) shows the G3808A clear base is much more fluid. 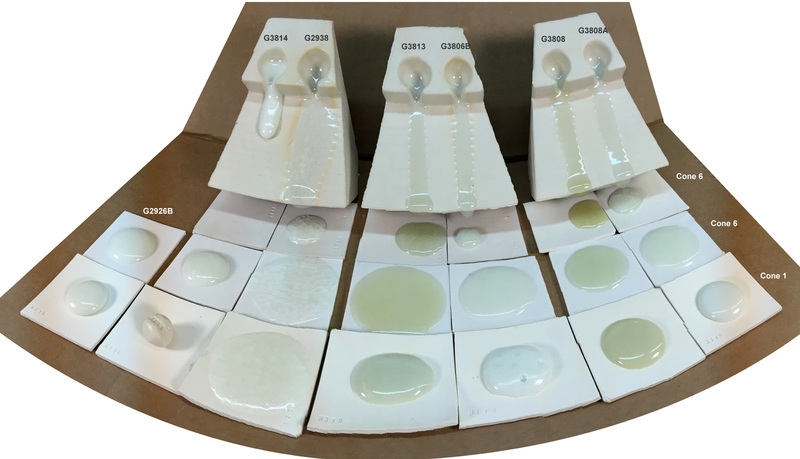 While G2926B is a very good crystal clear transparent by itself (and with some colorants), with 2% added copper oxide it is unable to heal all the surface defects (caused by the escaping gases as the copper decomposes). The G3808A, by itself, is too fluid (to the point it will run down off the ware onto the shelf during firing). But that fluidity is needed to develop the copper blue effect (actually, this one is a little more fluid that it needs to be). 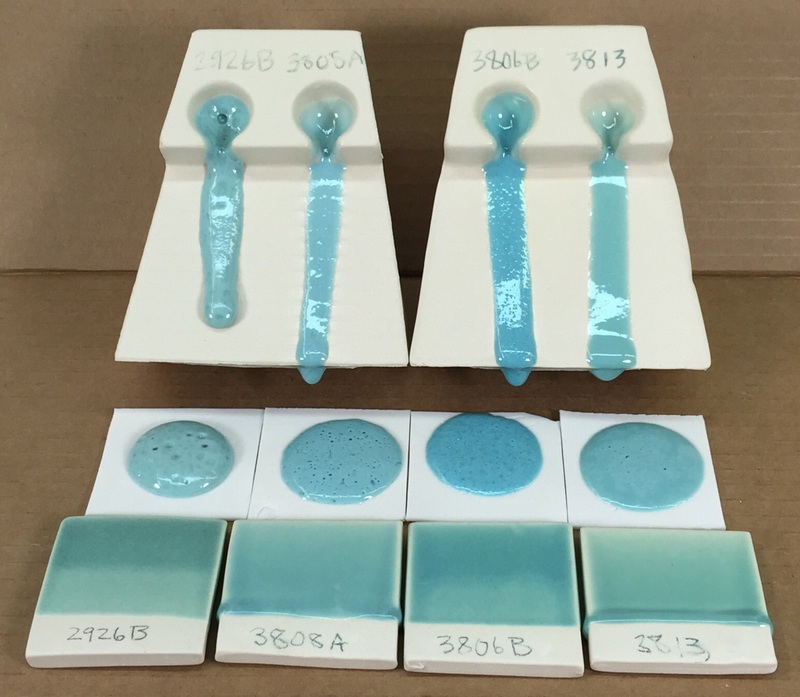 Because copper blue and green glazes need fluid bases, strategies are needed to avoid them running off the ware. That normally involves thinner application, use on more horizontal surfaces or away from the lower parts of verticals. 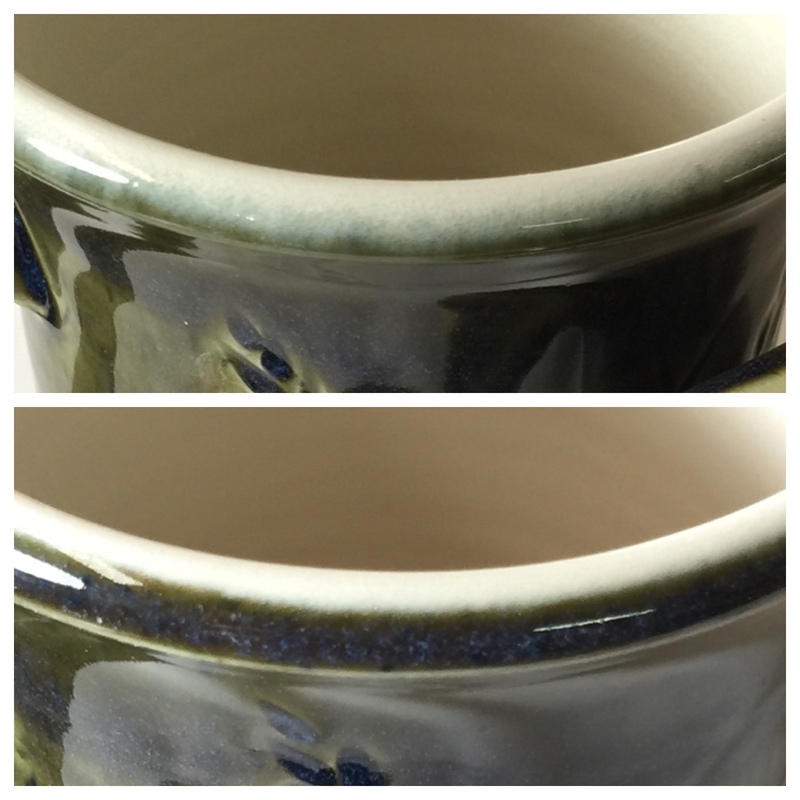 A step-by-step process to put a liner glaze in a mug that meets in a perfect line with the outside glaze at the rim.